The Perfecta series is "Made in Germany" and brings everything with what makes a decent pepper spray. In our shop we have 2 different versions. Animal Stop and the Stop Attack Xtreme. If the Walther / Umarex ProSecur pepper spray is too expensive, the Perfecta range is a reasonably priced alternative to successfully fend off an attack by a dog. 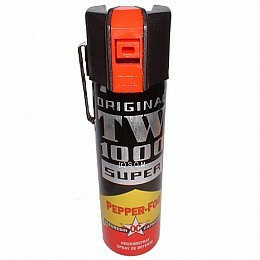 The pepper spray is produced by the Hoernecke company. Matching this size we recommend one of our 50 ml belt holsters. These are hard to beat and have an excellent quality. For maximum range with a strong stream of fog. The TW 1000 Super is the glaring opponent to the precise "FS standard". Super means a super-range and a wide-ranging fog, which also leaves no respite to objects ducking down. 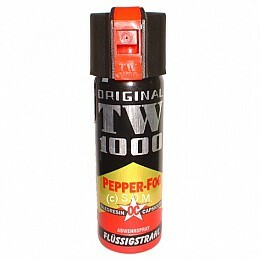 Hoernecke pepper spray are absolute top products for the personal security. Especially in high-sensitive areas with larger gatherings of people such as a VIP area or a fairground very precise defensive sprays are required. Well made, high quality holster. High quality and above all very resilient holster. The attached belt loop prevents the loss of the holster. It is especially suitable for use in security, police, etc.